Cross section through the more anterior part of the oral region showing the four more loosely spaced rows of cilia making up the quadrulus and more compact cilia of the peniculi on the left hand wall of the buccal cavity. The indentation of the endoral membranelle lies to the right just above the buccal overture. The vestibulum bearing somatic ciliature connects the buccal cavity with the outside of the cell. The ribbed wall covers the upper right side of the buccal cavity. mac, macronucleus. TEM taken on 1/31/74 by R. Allen with Hitachi HU11A operating at 75kV. Neg. 5,850X. Standard glutaraldehyde fixation followed by osmium tetroxide, dehydrated in alcohol and embedded in an epoxy resin. Microtome sections prepared at approximately 75nm thickness. 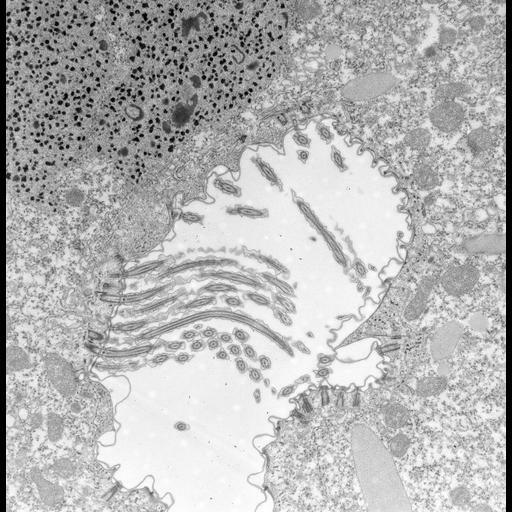 The raw negative was scanned with an Epson Perfection V750 Pro and this high resolution image is best used for quantitative analysis. Additional information available at (http://www5.pbrc.hawaii.edu/allen/).